The chest is the front part of a human’s body, from the neck to the abdomen. 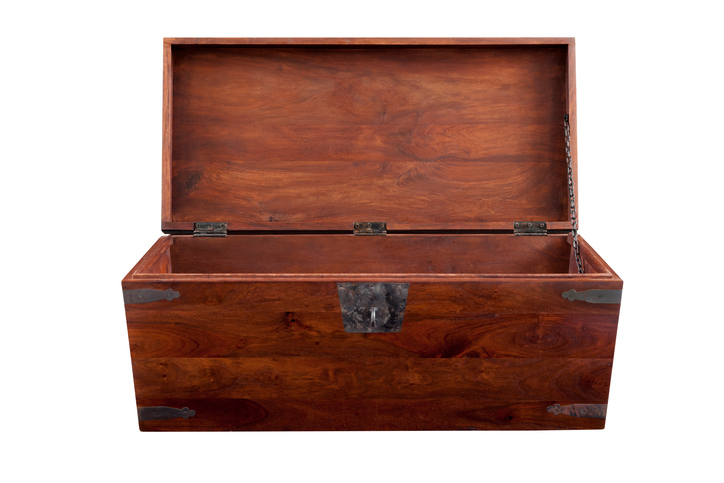 A chest is also a box with a lid used to store things or, especially in the UK, a small cabinet, usually hung from the wall, used for keeping small things such as bottles of medicine. In a public institution, the place where the funds, or money, are saved and the funds themselves are is also called chest. The man's shirt was unbuttoned, revealing a hairy chest. Margaret stores the spare blankets in a chest. You'll find a pack of aspirin in the medicine chest. The chest was empty; there was no money left! The college's chest is sufficient to be able to pay some small grants to students. chest of drawers: a piece of furniture consisting of a frame and several drawers. Example: “I keep my clothes in a chest of drawers.” A chest of drawers is not the same thing as a dresser, even in US English. A dresser may have drawers, but it is only hip height, and sometimes has a mirror. A war chest was what people used to call the (physical) chest kept by soldiers in their homes, or, when they were living with the army, in the barracks (ie, the place where soldiers live). It contained their arms, or weapons, and armor, and anything they would need to go to war at a moment’s notice. Nowadays, it is used figuratively to mean the money (or sometimes even equipment) put away by a person or company to be used in case of a dangerous or challenging situation. Chest dates back to before the year 900. The Old and Middle English cest or cist (pronounced chest or chist), meant ‘box, coffer or casket.’ It comes from the Proto-Germanic noun kista, which is also the source of the Old Norse and Old High German kista, the Old Frisian, Middle Dutch, and Middle German kiste, and the Dutch kist. The origin is not really Germanic, however. It can be traced back to a very early borrowing of the Latin noun cista (chest or box), which also gave us the English word cistern, and in turn comes from the Greek kístē, meaning ‘box.’ Chest, meaning ‘thorax,’ first appeared in the early 16th century, and was originally a figurative use, looking at the ribs as the container for the organs. Before that, this area was commonly known as the breast.